2018 Summer Book Recommendations: Podcast Edition! You are here: Home / Book Review / 2018 Summer Book Recommendations: Podcast Edition! We all know I totally enjoy giving out book recommendations as the search for nuggets is never-ending (please see the 2017, 2016, 2015, 2014, and 2013 lists). For this summer’s reading list, I thought I’d mix it up and create a podcast list instead of a book list. Why podcasts? In short, we all have “dead” time: the commute, mowing the lawn, cleaning the house, going for a run or at the gym. When I mean “dead time,” in my eyes, this is time I cannot read so why not “feed your head” with interesting audio. Podcasts are a modern form of “talk radio” and feature some of the top shows from NPR, CBC, and the Guardian. How much to you have to pay for podcasts? In almost all cases, podcasts are a free medium like television. You have to pay the cellular bill like your cable bill and depending on your cellular plan, you might have to be careful (unlimited data – no problem). If you do not have an unlimited data plan, then you can download the shows onto your phone over WIFI and then listen to them without eating into your data allocation. Where do I find the podcast shows? Both iOS (Apple) and Android have factory installed podcast Apps. Third-party Apps like Stitcher (both iOS and Android) and Overcast (iOS only) than can be downloaded like any other App. I personally use the factory installed iOS podcast App. Once you open the podcast App, search and recommendation functions are prominent for discovering podcasts. In addition, the podcast Apps all have a “Top 100” list or something similar to see what shows are most popular. How do you listen to that many podcast? Well…I don’t! I mean I have a cable box with over 500 channels but I do not watch 99.9% of the shows on those channels. I pick and choose, record a few TV shows here and there and if I get to them, I get to them. Of the 20 or so podcasts I subscribe to, there are only 3 or 4 that I listen to 100% of the episodes. Depending on the topic or who is being interviewed, say a great interview with an Adam Grant or an Angela Duckworth, I either listen to the episode or skip it if it’s not a topic or person that interests me. A final thought – I rarely listen to podcasts at normal speed and it’s easy to speed episodes up – plus the faster speed helps keep me awake for long commutes home at night. My default speed is 1.5 but some “slower talkers” I push up to 2.0. The same could be said for Audible which I also listen to at least one book per month. A 10 hour book can be reduced to 7.5 hours if you change the speed from standard 1.0 to 1.5. It only takes a few minutes to adjust the slightly faster speed. As for the podcast recommendations, I did my best to group them into categories. 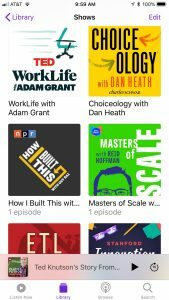 My suggestion is to download 5 or 10 podcast shows to your phone and explore the episodes. Just like television, you’ll know in an episode or two if you really like the show or not. By no way is the list below exhaustive but it sure is something to get one started. -The TED Radio Hour – NPR mashes-up 4 or 5 TED talks on a similar theme and makes a show!